The TecTecTec VPRO500 laser rangefinder created a stir in the market by legitimizing the phrase ‘budget laser rangefinders’. The groundbreaking device brought reliable ranging technology within the reach of mere mortals. The TecTecTec VPRODLX laser rangefinder continues progress down the path of this trend. The Deluxe has a smoother operation with improved build quality. 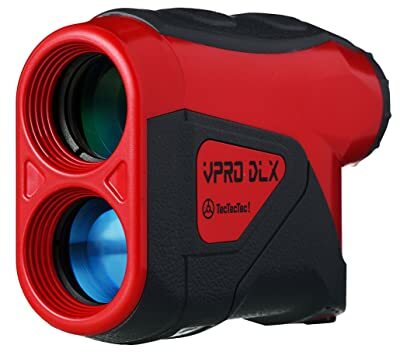 If you are looking for improvements upon the existing technology in his price range, the VPRODLX is a feature-rich laser rangefinder to consider. 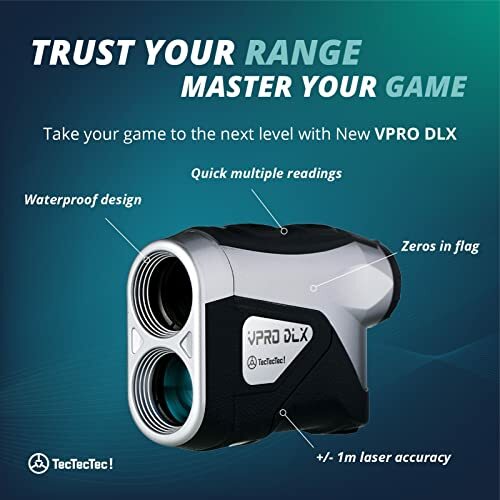 The TecTecTec VPRODLX laser rangefinder plays on all the strengths of its popular predecessor Tectectec VPRO500 Golf Rangefinder. But it comes in a sleeker, more portable package with much easier level of operation. The VPRODLX is a handy device. Its robust make means it will easily live out its price. The shockproof, waterproof body can take the strain of continuous use. The multiple ranging modes allow you to measure distances in various scenarios from shaky hands to horizon scans. The accuracy is similar to the Nixon Coolshot 20 which is pretty decent at this price. The wrist strap to the rangefinder is a highly optimistic but nice touch. The TecTecTec VPRODLX laser rangefinder has a simple but highly effective feature set. The design and spec have a number of quirks that we investigated to see if it deserves the asking price. The TecTecTec VPRODLX laser rangefinder walks a tight balance between portability and a stable position in your grip. It weighs 6.56 ounces and measures 4.1” x 2.8” x 1.6”. It comes with a wrist strap. The idea is to hoist it on a wrist strap to carry it around. But we think it’s a little bulky for that. But it’s definitely easier to hold steady than the Nikon Coolshot 20 which might be too lightweight for some. In spite of the low price, the TecTecTec VPRODLX has a hard body with a grippy cover. The gripping area is covered in smooth but patterned rubber. It is comfortable to hold with and stays steady without slipping and shaking. 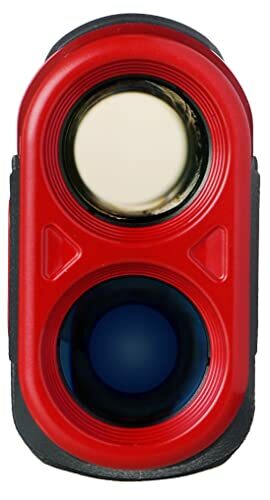 This laser rangefinder has two buttons on the top surface. This can toggle through the three ranging modes and other functions. The eyepiece has a focus ring on the eye piece which allows you to zoom closer on the view for maximum resolution. The TecTecTec VPRODLX laser rangefinder is waterproof. We still wouldn’t recommend dunking it in the water but it won’t get damaged if it catches a bit of rain. 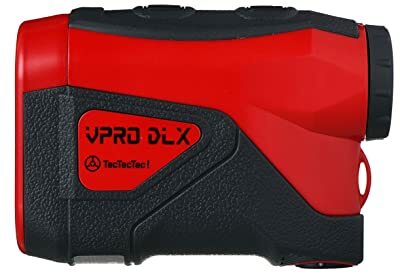 The TecTecTec VPRODLX rangefinder offers a Pinseeker mode that automatically tries to lock in on the flag even if it’s situated between various other objects. While this is very helpful, it is not as effective as the Pinseeker functions of Bushnell models. You still need a very steady hold to get the VPRODLX to deliver correctly in this mode. This is not the default mode but it ought to be. In this mode, the VPRODLX rangefinder finds distance to the closest object in the field of vision and ignores all the objects behind it. This way, if the flag is positioned in front of the bushes or trees, this rangefinder will find distances specifically to the flag and disregard everything behind it. This mode is extremely useful when you are trying to plan your next few swings. It allows you to range the distances to multiple hazards or milestones on a hole in one go. You can pan across the horizon and find the distances as the rangefinder locks on to each one of them. The TecTecTec VPRODLX offers distance ranging up to 600 yards. The most effective range is within 200 yards where it maintains good accuracy. Beyond that, the accuracy depends on the steady hold of the golfer and the clarity of the target. Still, the range is higher than both Nikon Coolshot 20 and Precision Pro Nexus. The multilayer lens offer good clarity of the field. The viewing field is bright but has low resolution compared to the higher-end laser rangefinders. Within a 200-yard distance, the VPRODLX offers an accuracy of 1 yard. Some of the pieces have been known to less accurate. This inconsistency in the quality of pieces is the one drawback that reflects on the low price of the unit. The TecTecTec VPRODLX laser rangefinder has an automatic power down feature which shuts it down after a few seconds of idling. The battery, consequently, lasts through a few months without any decline in functionality. The TecTecTec VPRODLX laser rangefinder is easy to operate with the two buttons. It is not as intuitive as the Precision Pro Nexus. Still, you receive the distances almost instantly. The long range laser can satisfy even the most proficient golfer who hits long distances. Aiming the laser ranks above average in comfort and stability. Nexus is more stable to hold and aim, partly because of its higher weight and the honeycomb pattern on its gripping area. There’s no learning curve to using VPRODLX as it has only two buttons. TecTecTec claims VPRODLX can aim up to 600 yards and extend to 900 yards for targets with reflective surfaces. While we are unlikely to reach those numbers in golf, they might be useful while hunting or ranging for other purposes. The design barely got scuffed with our constant use. We liked the battery life which was longer than Precision Pro Nexus. The TecTecTec VPRO500 was hailed highly as the next big thing. While the VPRODLX laser rangefinder is not a huge improvement, it does have many takers, especially the ones who waited for a better version of the ﻿﻿﻿VPRO5﻿00. It has created a lot of excitement in this price range although the golfers trust the Nexus more in terms of accuracy and ease of operation. VPRODLX ranks better in physical handling as opposed to the smaller Nikon Coolshot 20. It was rated more portable than the Nexus too. If your budget is modest, we recommend checking out this laser rangefinder. It borrows heavily from a winning design. The TecTecTec VPRODLX laser rangefinder wins brownie points because it’s quite similar to its predecessor, the impressive VPR500. The cosmetic changes made in VPRODLX version are appreciated. They pitch it as a strong contender in this price range, although it’s not the best. It is highly portable device with a wide and relevant feature set for the price. If you have a steady hand and can take advantage of the features, this unit is worth a shot. Check out more details about our picks best golf rangefinder in 2018.